MOTT HAVEN — Rappers feed off great beats, but they're nourished by great books. That’s one message the hip-hop-centric Rebel Diaz Arts Collective hopes to convey to local youth with a community library they will soon run out of their headquarters in a former candy factory by the Bruckner Expressway. “I tell them, ‘The more you read, the iller you’ll be as an emcee,’” said Rodrigo Venegas, aka Rodstarz, one-third of the rap crew, Rebel Diaz, and a founding member of the cultural collective with an activist bent. 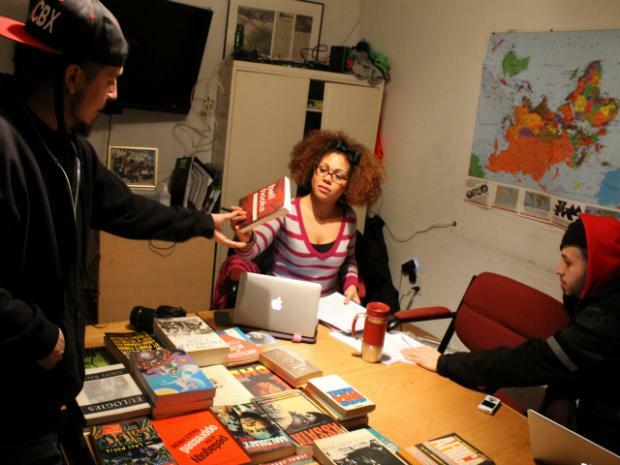 The roughly 20-member collective has partnered with Bluestockings, the independent Lower East Side bookstore, to amass about 300 mostly donated books on radical politics, Hispanic and black history and hip hop. By erecting the small library in the same space where it hosts monthly hip-hop open mic nights that draw rising rappers and their fans from across the city, the collective is trying to convince these young people that the slickest rhymers are often also the sharpest readers. The Richie Perez Radical Library, named for a South Bronx educator and activist who died in 2004, combines works by influential thinker-agitators, such as Angela Davis and Malcolm X, with writings by hip-hop luminaries including KRS-One, the RZA and Jay-Z. The collection is still expanding, Venegas said, but the library should be up and running in the next few months. It will start as a reading room, but begin lending once all the titles are cataloged. Sky Cohen, a Bluestockings worker, gathered most of the books by appealing to contacts at colleges across the country, who mailed spare tomes from such far-flung places as Hawaii, Montana and Washington. Cohen selected titles by minority writers or about often-overlooked chapters in history, he said, based on his experience working with incarcerated youth, who he found were turned off by literature and histories that centered mainly on long-dead white men. “They rejected it because they didn’t see themselves reflected in it,” he said. In December, the collective organized a two-day festival at Hostos Community College, called South by South Bronx, which combined workshops on the practice and politics of hip-hop with live performances. In the past, the collective has taught teen workshops on photography, video editing and music recording at their center inside the former factory on Austin Place. Now, they hope more of those youth will stop by the 4,000-square-foot space to peruse some radical literature, conduct research for school or join a book club devoted to texts they might not otherwise encounter. On Sunday, the group will throw a benefit concert to raise money to construct a space inside the center to house the books. Rebel Diaz and a surprise guest group will perform and Martha Laureano, the wife of Perez, the library’s namesake, will attend. De la Cruz said she recently spoke with Laureano and was pleasantly surprised to hear that Perez, who once taught at a South Bronx high school and edited the newspaper of the Young Lords, a Puerto Rican empowerment group, was not only a man of letters, but also a serious fan of hip-hop. The benefit concert is planned for Feb. 10 from 5 to 8 p.m. at the Rebel Diaz Arts Collective space at 478 Austin Place. Donations from $5 to $20 are requested.